I am here in the trenches with you. Small kids who all want to sit on the same place in your lap. A dog begging to be exercised. A loving husband you are so wanting a moment of quiet with. Three children in 3.5 years. Juggling marriage, children, church, and work. It was an act to keep those plates in balance and spinning, and not letting anything fall for fear of failure. For the type A’s out there, it can be a lot to try and control, direct, and plan. Is everyone getting enough attention? Is the laundry done? Am I putting a healthy, homemade dinner on the table? Did I make time for my daily Bible reading? And oh, by the way, did I exercise today? It can get exhausting, and quickly. In the beginning of my motherhood journey, I thought saying yes to everything was the only acceptable answer. I was afraid of what no meant. But what if the gospel calls us to something more then yes to everything. What if we said no? Or what if we dared to make sure our yes was to what is most important. What is my best yes? A dear friend and I always remind each other that “saying yes to one thing is actually saying no to another.” When I come back to the heartbeat of the Bible, I am reminded that Christ tells us in Luke 10:41-42 when he visiting Mary and Martha. “You are anxious and troubled about many things, but one thing is necessary. Mary has chosen the good portion, which will not be taken away from her.” Mary paused in her daily duties to sit at the feet of Jesus, and listen. She wanted to know Him. She wanted Him to know her. Martha kept busy. She was worried about what the house looked like and how prepared she was for the visitor. But in the midst of her busyness, she missed out on the opportunity to hear wisdom directly from Jesus. So now I must pause. I must evaluate. My reading of Luke causes something in me to stir. Sure I can check all the to-do boxes off my list, but if I haven’t stopped and carved time to feed my soul with my bible reading and intentional prayer – have I really prepared myself for the day? My heart and mind both tell me no. I can serve the best meals, have all the laundry done, work my guts out, but still not be prepared spiritually to walk in this life or the next. So let’s sip that coffee, eat that little piece of dark chocolate and let the laundry sit another minute mamas while we pull out our Bible and lift our needs, worries, and thanksgiving up to God. Let’s say yes to the one thing that matters most. That is my best yes. The internet can be a wonderful thing full of information and inspiration, recipes, and quotes…but it can also be a black hole where all we see is a picture of what looks like “the perfect life”. And we go from focusing on God to focusing on self. What we don’t see is the real. The real messy kitchen (b/c who is actually going to share that…), the real look of a sleepless face, and the real frustration when our kids aren’t listening. The raw moments. The real moments. The tears and the laughs. Those aren’t posed pictures, but threads that makeup our ordinary lives. When we get caught up in the cycle of comparison, what good can come from it? Instead of focusing on the blessings, our minds gravitate towards the how, why me, and why not me. The thief has tiptoed in and stolen our joy. The focus has gone from Christ to self on the road to comparison. And we’ve happily taken a road trip. I don’t want to measure myself by likes and followers, but by how I’ve loved and shared the truth. So what do we do? How do we change the destination? How do we return the focus to Christ? I pray that we may all find our quiet space today. May the silence and His words fill us up in ways that draw us back in over and over again. May we be fed by the true everlasting bread. May we rest in the silence, and know He is God. All the schools here have closed due to illness. The plague has hit our home, and we have surrendered and have stopped trying to fight it. In the past, the idea of sick kids would have left me feeling overwhelmed, tired, and hopeless. But, this time I’ve unraveled the lies and reminded myself 1) this won’t last forever 2) I’m not alone in this and 3) We have everything we need. When the well is running dry, the only place for me to run is to my Bible. While my dark chocolate stash might suffice for a minute, it’s just temporary fuel. My real source of strength is in the arms of my Father. That’s real life, right now. I listened to a podcast recently and the phrase “grace, not perfection” resonated with me. I keep hearing the women around me say they no longer want to live feeling frantic. They seek a simplified, authentic, heart-driven life. We don’t need more perfectly curated squares on instagram or facebook. We need more circles of real, authentic friendships and community. A place to say come as you are. No filter required. We need more truth-telling, and less how-to tutorials to get the perfect body, hair, business… you fill in the blank. When we are striving for an impossible pursuit of perfection, we dismiss the gift that God gives us to not do it all perfectly. God beckons us to come as we are. He calls us out of our pursuit of perfection, and into a place of rest. We receive the gift of deep-seeded joy. We stop striving for the things of this world, and start contemplating the everlasting. John 10:10 says “The thief comes only to kill and destroy. I came that they may have life and have it abundantly.” The abundant life calls me out of pursuing perfection, and into receiving the gift He comes to give. A life that is meaningful, purposeful, joyful, and eternal and most of all God-centered. It’s February. We are in the business of bundling up, tidying up, and trying to keep the goals we set at the start of the new year. Let’s face it, we are good at being busy. We are good at staying busy. But somewhere between work, preparing the meals, and late night cleaning/packing lunches/and laundry sessions we forgot about one key ingredient: ourselves. Recently I took back something that I had long put on the bottom of my to do list, working out. Regularly. I’m not talking about the occasional run here, or that drop in barre class, but serious self-commitment to returning to the gym. On a regular basis, scheduled out, during the week. Stop the train. This didn’t make me a bad wife, mom, or friend. Rather, I’ve found it to make me better – (insert all the roles/titles one can have). This was a 6 year journey for me, I have twins, and another little one that I just couldn’t see past trying to fit another thing into the day… there was too much already that needed to be done. But Moms, we are important, so important that we need to show our children how to care for ourselves. And we deserve it. Self-care is not selfish, but an act of self-preservation. And so a little practice I started December 30th, has now become a weekly habit. A beautiful rhythm has been added to my days. Something that gives back to me in a way I so desperately needed, but perhaps didn’t recognize in the tides of busyness that came and pulled me in. I am now longer treading water now. Instead, I’ve figured out how to move with the flow. Along with this practice, my daily bible reading is another way I refuel. So I want to challenge you to think about what’s something you can do for you. It doesn’t have to be a huge thing, but rather in what ways can you show up better for yourself, and often. We can’t pour from an empty cup. Let’s show our spouses and our children we love them by how well we care for ourselves. January has come. She has come greeting us with dark, frosted mornings and chilly fingers. She has come with mittens and hats sprawled across the floor, and endless layers, but no snow. We had a delicious winter break, fully equipped with late starts, no agenda, and lots of time spent at home playing. We are incrementally creeping back into our normal routine…this week makes week 2 of being back to school (so we really should have it together!). How many of us have hit mid January and shouted, “Sun where are you?” I’ve been there. The grey has tinted not just my walls, but my mindset. This is where the wonderful concept of Hygge has lightened my winter woes. A few winters ago I took it upon myself to do a little self study of the Danish lifestyle tradition – Hygge. A tradition centered around the feeling of cozy contentment and well-being through enjoyment of the simple things in life. If you have ever enjoyed a good book on a rainy day, or the pleasures of a random snow, you’ve experienced hygge. 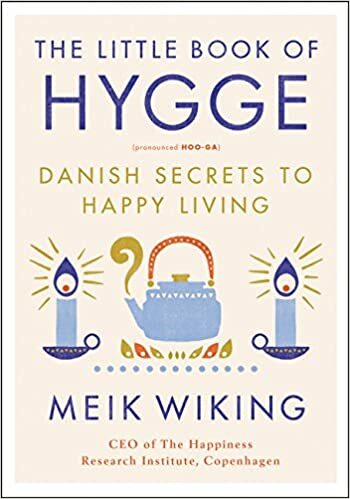 As freedom is to Americans, Hygge is to the Danish. Instead of wishing away winter, hygge calls for us to get comfy and cozy. Hygge is a feeling. The term has no literal translation in English, but is frequently described as ‘togetherness’ and ‘coziness’. It is the “art form of creating intimacy in any given moment.” And who of us couldn’t use a little bit more of that? It’s friends gathered around the fireplace with full bellies after breaking bread. It’s lusciously soft blankets, and chunky knit pillows to welcome rest. It’s favorite photographs and art, and hobbies that encourage us to stop and slow down. So as another brisk January morning greets me, I am lighting my favorite candle during breakfast and hygge’ing my way into the new day! I spend approximately forty to fifty minutes everyday in the car. I’m driving to the office, I’m picking up kids, and I’m out running errands. I’ve become obsessed with the idea that I can learn something while I’m driving! What better use of time in the car, then to do some laughing, learning, and self-reflection. I’ve reviewed three of my top fav podcasts below. I encourage you all to check out one of these podcasts next time you find yourself sitting in traffic or the school pick up line. Tune in and recharge! I bet you will find yourself encouraged and inspired. 1. The Next Right Thing with Emily P. Freeman. This podcast is my go-to every morning. For second-guessers, the chronically hesitant, or anyone who suffers from decision fatigue, best-selling author and host Emily P. Freeman helps create a little space for your soul to breathe so you can discern your next right thing in love. Because out of the thousands of decisions you make everyday, chances are a few of them threaten to keep you up at night. If you’re in a season of transition, waiting, general fogginess or if you’ve ever searched “how to make a decision” on the internet, listen in. Each episode is 15-20 minutes long. Short, sweet, and encouraging! 2. For the Love! with Jen Hatmaker. For the love of … People. Home. Stories. Shoes. Family. Jesus. Community. TV. Accessories. Food. Culture. The New York Times best-selling author and star of HGTV’s “My Big Family Renovation,” invites you to drop by and catch up with her friends as they laugh and share about all the things we love. Jen Hatmaker keeps it real, and keeps me laughing. I love the guests she has on the show, many are authors of the books I end up reading next, or the entrepreneurs I now follow. She has seasonal themes for her podcasts, such as For the Love of People. For the Love of Women Who Built It. For the Love of Laughter. Her guests will inspire you! 3. 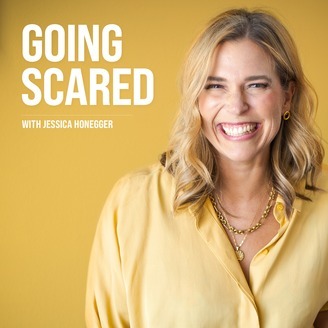 Going Scared Podcast with Jessica Honnegger. In case you haven’t heard of Jessica, she is the Founder and co-CEO of Noonday Collection jewelry (jewelry and accessories sourced around the world from fair trade artisan partners). In each episode of The Going Scared Podcast, Jessica walks you through what it looks like to move through your fears toward a life of impact and meaning. Join Jessica and change-makers from around the world and from your backyard for a bi-weekly conversation that will motivate and encourage you. Ready to make your move? I love the Going Scared Podcast because it forces you to ask yourself questions, and reflect on what is most meaningful among all the noise of our daily lives. Let me know what you think, and comment with your favorite podcast below! What I did find were other twin mommas who so graciously shared the real and the raw about raising two babies at one time. I struggled with things like how to cook dinner during the witching hour, how to consume 2500+ calories while pregnant, and how to manage going out in public when they started walking (in two different directions!). These mommas formed my tribe, and I thank Jesus for them and their quiet encouragement they gave, especially during the first year. When you learn you are expecting, a million questions go through your mind. When you find out you are expecting twins, your legs shake and you smile (you also hold your husbands hand and squeeze it till he’s lost circulation) while you digest the big news! You are thrilled, and wowed all at once. You ask yourself, how did this happen…and you trust God has a lot more confidence then you have in yourself. I knew having twins would be one of the most rewarding and challenging experiences of my life. I wouldn’t change a thing about our journey, and in fact we loved this part of our journey so much that we went on to have another baby. Child rearing has made the relationship between my sweet husband and I that much stronger. When you get up together during the middle of the night, when the rest of the world is asleep, and each feed a small (4.5 lbs.) baby, something magical happens. All the world is silent in that moment, you make eye contact (because you don’t dare say anything to wake those babies up even more) and you realize your family is your world.